Just like any other vehicle, forklifts need regular servicing to ensure optimal performance and minimise the risk of untimely breakdown or failure. Whether you own, operate or manage one or more forklifts, a regular service is vital if it’s to stay in peak condition. We’ve put together a complete guide to forklift service, giving you information on key topics such as: what to look out for; what standards your service should meet; and what type of forklift repair jobs might need doing. Read on to discover the important facts you need to know to ensure that your forklift maintenance goes as well as it possibly can. If you need forklift maintenance or a forklift repair, it’s important to work with professionals who understand forklifts and have the necessary skills to maintain them safely. The best type of technicians to carry out the work are those who hold a specific qualification relating to forklift work. Appropriate qualifications are on offer through a number of different bodies, including the Fork Lift Truck Association. Usually, the best type of person to work on your truck is somebody who’s gained the specialist knowledge necessary to get the job done properly. In general, a non-specialist technician is not going to be able to service your forklift appropriately. Before committing your forklifts to a company for servicing, check that the technicians who are going to do the job have the appropriate skills, qualifications and experience to make a good job of it. It’s also worth checking what level the most experienced members of the team might have. Obviously the more expertise and experience there is within the inspection, servicing and repair team that can be utilised for your benefit, the better. Have you considered field service engineers? Field service engineers, as the name suggests, will come out to you wherever your forklift might be. Ideal for busy organisations that want to minimise the amount of time a forklift is out of commission, a field service engineer can perform a full service, quickly and easily. In comparison with technicians, field service engineers tend to be more highly qualified and are able to perform more sophisticated procedures. Because they tend to be more qualified than a simple technician, they can often diagnose and resolve more complex issues, as well as work in almost any location unsupervised. What should a service include? A service normally incorporates daily tasks, as well as those which need completing on an annual basis, if not more frequently. Daily tasks include: testing brakes; topping up fluid levels; performing a visual inspection for signs of wear and tear; testing beacon, reversing alarm and similar safety measures; checking tires for signs of wear. These are all essential checks to ensure that forklift trucks comply with relevant health and safety guidance. – checking less accessible fluid levels: the hydraulic oil, transmission oil, drive axle oil and drop box oil. – visually inspect the rest of the vehicle, looking for anything amiss. Completion of these tasks won’t just enhance the performance of your vehicle, it will also ensure compliance with relevant health and safety legislation. 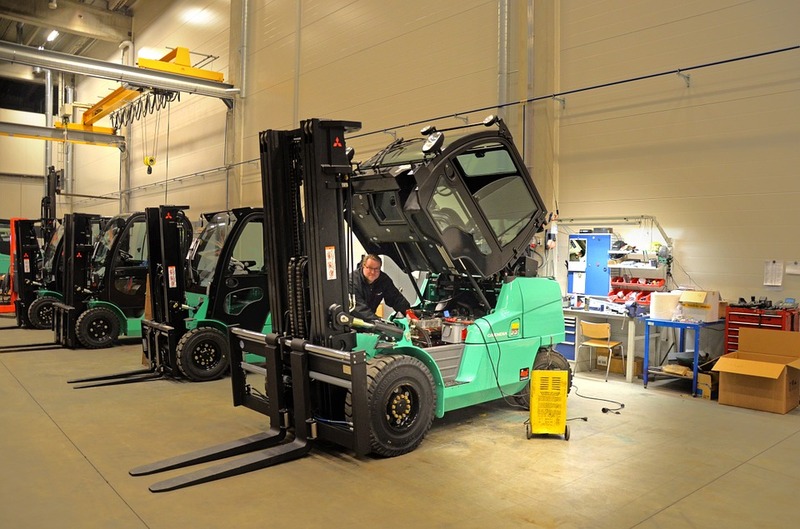 With so much emphasis on healthy factory working, forklift servicing plays a vital role in both ensuring that any problems are dealt with promptly as well as maximising the likelihood of the vehicle being safe to use. The reasoning behind the choice of common service options is that once your vehicle has been approved by us, you can expect to enjoy better performance and also reduce the risk of future failure. The list of servicing tasks has been carefully selected to cover the areas where a fault is most likely to develop, as well as those parts of the truck lift which have the most essential part to play in reducing the risk of an accident (particularly the brakes and the steering operation). In general terms a service is very similar to an MOT, but with the added focus of ensuring optimal performance, not just concentrating on the safety of the vehicle. Although there are normally a number of set tasks which are included as part of a forklift service, there’s no reason why you can’t request a specific task if you wish. As one of the parts of the vehicle that moves frequently during operational use, the mast is particularly prone to wear and tear. The chains may well become twisted, fractured, rusted, bent or otherwise compromised, leading to problems with use. In some cases the level of hydraulic fluid may become unacceptably low, leading to difficulty in operation. A service technician will check these issues, suggesting a prompt forklift repair should any issues be discovered during the service process. Like the mast, the steering mechanism of a forklift truck is in motion almost continuously. Because forklifts often complete complex manoeuvres in tight spaces, the wheel is frequently turned from one extreme to the other, causing a significant amount of wear over time. This can cause worn out gears or a drop in steering fluid transmission. In some cases, other parts of the steering system may give way. Part of the servicing process ensures checking the steering mechanism carefully, picking up any problems promptly. One of the most fundamental functions which the forklift is required to complete, engine starting can become a challenge for all sorts of reasons. Failing plugs or a starter motor may be to blame, alternatively, the battery may be flat or some of the fluid levels in the engine may not be correct. The radiator in forklifts is vulnerable: if particles have managed to penetrate into the radiator, they can collect, causing an unwelcome blockage. The technicians you choose should be able to complete any repairs or replacements necessary to ensure that the forklift’s engine starts first time, every time. Brakes and tires aren’t just parts of the forklift which move frequently, they are also key parts of the vehicle when it comes to safety. Servicing involves checking both tires and brakes minutely, looking for any early warning signs that failure might be imminent. Because tires and brakes are subject to heavy use, it’s almost inevitable that they’re going to need replacing fairly often. Servicing allows problems to be identified early on, allowing time for appropriate replacements to be put in place in order to ensure the smooth running of the forklift truck in the future. Although these are quick to rectify, a blown bulb or inadequate amount of fluid can cause all sorts of problems. Blown bulbs don’t just impede illumination for the driver, if bulbs responsible for warning lights and similar safety lighting is compromised, the forklift is probably too damaged to be driven. Nobody wants to see a forklift inoperable due to repairs that are extremely easy to complete successfully. Regular checking of bulbs and fluid levels ensure that swift remedies can be put in place to deal with the situation. One of the problems with completing forklift servicing and repair is that it takes time. Particularly if you’re a small business but also a busy one, there is a tendency to put off servicing until times are less busy. The problem with delaying a service is that the risk of ending up with a failing forklift become higher the longer it is before a service is finally arranged. A good repair company will be able to come out and conduct a suitable service on site. No need to send your vehicle off for servicing – it can all be done nearby! An issue with using less well-known companies to complete your servicing is that they won’t have the necessary technical knowledge when it comes to work-related health & safety. Fork Truck Direct can provide suitable information on all aspects of health & safety and other relevant legislation as it relates to forklift vehicles. With in-depth knowledge, a company can ensure that the forklift truck is in a suitable state for safe, legal operation. This is essential in industrial environments, where there is a potential for significant danger and the right type of pro-active approach to health and safety is essential. Fork Truck Direct is a leading provider of forklift repair and servicing to a variety of industries. The company can provide servicing in the field, in line with your timetable, or can conduct some in-house servicing if required. Offering a thorough service that’s ideal for forklifts that endure heavy, daily use as well as those that are relatively lightly used, each service is conducted by qualified and experienced technicians. If you want to trust your vehicles to experts who understand the constraints you’re working under as well as the need to ensure that your vehicles are in the very best possible condition, we can help.